The owner’s original three-bedroom, 2.5 bathroom house was completely destroyed in the Oakland Hills fire of 1991 in Oakland, California. 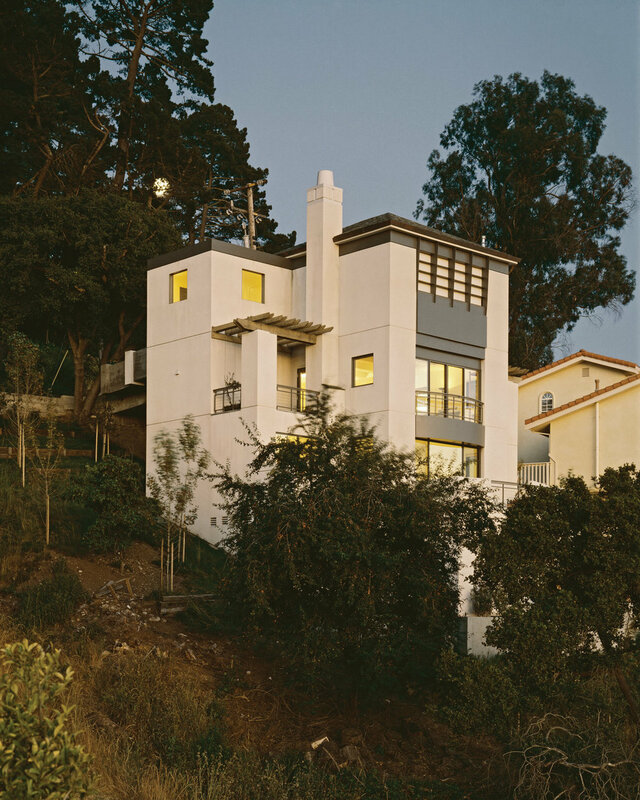 The very steep down-sloping lot has panoramic views of the five bay bridges, but the small lot greatly restricts the floor plan footprint as well as the height that is allowed by the Planning Code. The owner wanted to rebuild a new home, taking advantage of the views and cost-efficiently maximizing the space. Due to the nature of the small lot size and situation, combined with cost concerns, we developed a new house design that had a compact and efficient footprint at 2,000 square feet of living space plus a 500 square foot garage. The floor plans had minimum space dedicated to circulation alone. We also stacked the new house vertically to minimize the size of the overall footprint, creating a more efficient envelope and keeping structural costs down. The living and dining areas needed to be relatively small but we wanted to create a feeling of spaciousness, so we combined the spaces to make them fluid and open. 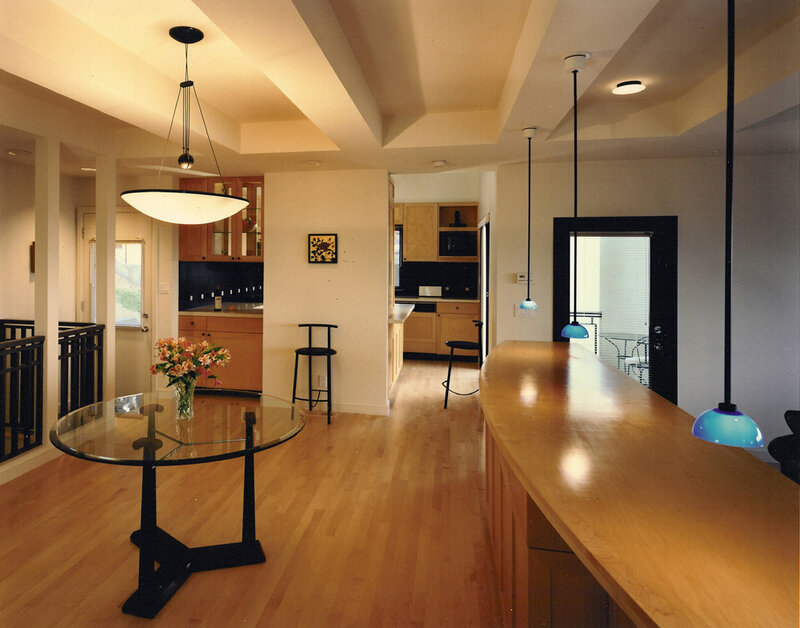 Two-story ceilings in the kitchen and entry contributed to the sense of openness and space. 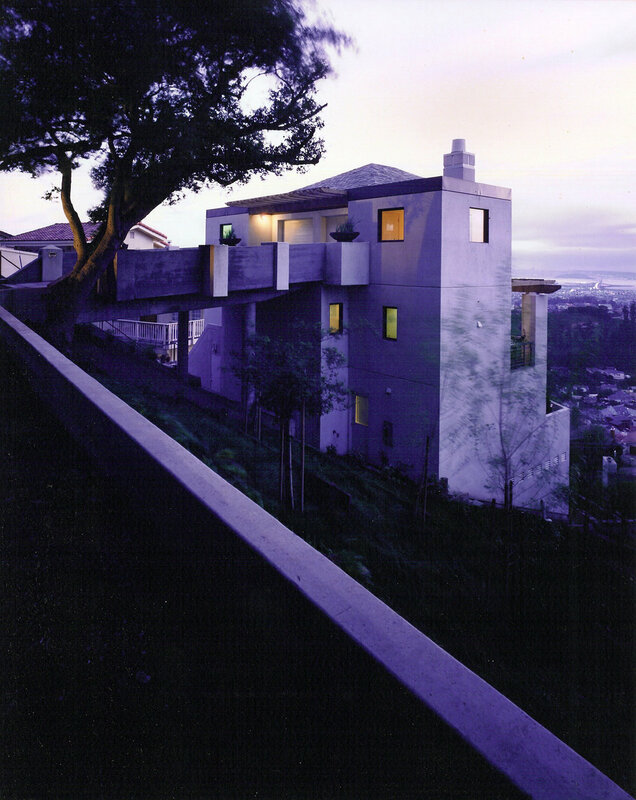 This steep Oakland hillside lot also presented a challenge connecting the street to the garage and house entry. To avoid an unsightly stand-alone garage structure, we placed the garage at the top of the new house and connected it with a poured-in-place concrete bridge to the street. The bridge was designed to be more than utilitarian, containing a bench and also serving as the main access to the house. Terraces off the main living areas and bedrooms connect the house structure and surrounding areas. 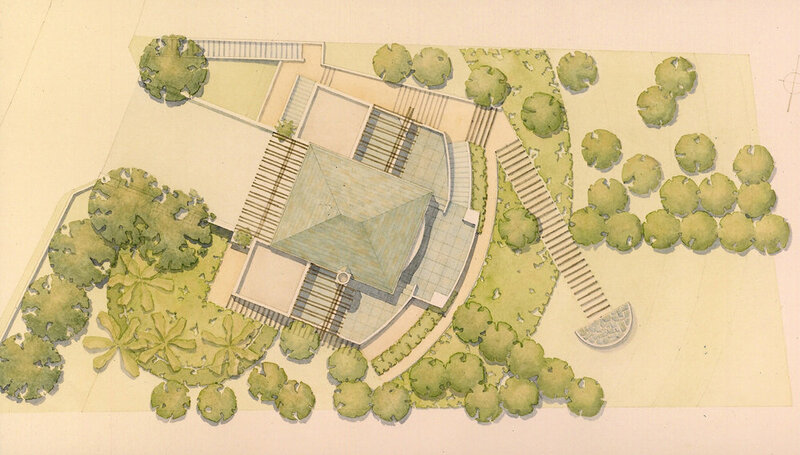 The design of the new house reflects craftsman and Mediterranean themes with a contemporary feel.